BINGAMAN, HESS, COBLENTZ & BELL, P.C. CIVIL ACTION - LAW... BINGAMAN, HESS, COBLENTZ & BELL, P.C. CHANGE OF NAMEIN THE COURT OF COMMON PLEASOF BERKS COUNTY, PENNSYLVANIACIVIL ACTION - LAWNO. NOTICE IS HEREBY GIVEN that the Petition for the Change of Name has been filed in the above named Court, praying for a Decree to change the name of Jonathan Richard Mikula to Jonathan Levi Mikula. 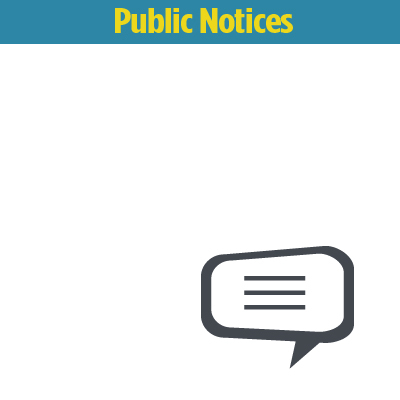 Notice is hereby given that West Reading Environmental Advisory Council meeting, previously scheduled to be held on Wednesday, May 29, 2019 at 6:00 p.m. has been changed. The meeting will be held at Borough Hall, 500 Chestnut Street, West Reading on Monday, May 20, 2019 at 6:30 p.m.
Estate of Ronald R. Koch late of South Heidelberg Township, Berks County, PA, Deceased. EXECUTOR'S NOTICE Estate of John Calvin Booser, Jr., a/k/a J. Calvin Booser, Jr., a/k/a John C.
Estate of John Calvin Booser, Jr., a/k/a J. Calvin Booser, Jr., a/k/a John C. Booser, Jr. late of Wyomissing, Berks County, PA, Deceased. Estate of Ray Ott, a/k/a Cornelius Ray Ott, a/k/a Cornelius Ott late of Exeter Township, Berks County, PA, Deceased. EXECUTORS NOTICE Notice is hereby given that Letters Testamentary on the Estate of Dorothy A.
Dorothy A. Bicksler, late of the Township of Tulpehocken, County of Berks and Commonwealth of Pennsylvania, deceased, have been granted to the undersigned Executor. Estate of Joan M. Seyler late of Exeter Township, Berks County, Pennsylvania, Deceased. Separate Sealed bids will be received, in duplicate by Douglass Township, Berks County, PA until 11:00 A.M. prevailing time on May 9, 2019 for the 2019 Annual Road Project. This invitation to bid is for approximately 15,000 gallons of Potassium Permanganate for the City of Reading, Pennsylvania, on behalf of the Reading WWTP. approximately 2:05 p.m. on May 17, 2019. PA 19512, until 2:00 PM on May 16, 2019, for the 2019 Road Repair Project. Bids will be publicly opened and read and a contract award will be considered by the Board of Supervisors at their meeting on May 16, 2019 at 7:00 PM.